Uncle Jack Live VR puts the player in the director’s seat, behind the scenes on an episode of Uncle Jack Live starring Wellington Wells’ biggest celebrity. You’re able to build a full broadcast by choosing the best bit of news the host will then read. Get it right, and Uncle Jack rolls with the punches. Get it wrong, and he’ll cheerfully fix it for you... but he won’t forget. Make him angry enough and he’ll outright stop the broadcast. Simultaneously, you have to help prevent a Downer Outbreak, which involves dosing all your coworkers with lots of lots of Joy. In addition to the game aspect, Uncle Jack Live VR also includes an archive mode that has a media archive, official soundtrack selections, trailers, and animation reels. 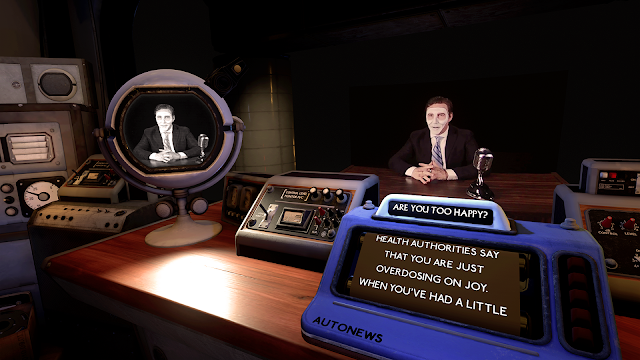 The full We Happy Few title will be out on August 10 for PC, PlayStation 4, and Xbox One. There are no shortage of charming indie titles available on the Nintendo Switch. In fact, if any console has had a better first 18 months on the market, we can’t think of one. But that doesn’t mean we’re not always up for more, and Tale of the Ice Staff looks like it could be one. Pitching itself as a 2D RPG, there’s more than a slight whiff of Secret of Mana about Tale of the Ice Staff, which would be a great thing indeed since the remake of the actual Secret of Mana was a dud and a half. We don’t have many more details other than the short trailer, above, but there’s plenty of time to learn more about this one; it’s not out until 2019. At this stage it seems to be a Nintendo Switch exclusive, but other platforms might be added down the track. Climate change means the winter weather is getting more extreme than ever, so it’s always good to know you’ve got a nice scarf to keep you warm. Or in this case, Scarf, a game developed by Uprising Studios and published by THQ Nordic. It is coming to PC this (Northern) winter. Scarf is a 3D platformer designed for all ages to enjoy. Hyke has a polymorphic red scarf that he can use to explore a magical environment, solve puzzles, and overcome challenges. The scarf can morph into different objects to help Hyke along his journey. Interestingly enough, the narrative here is told completely through visual gameplay rather than text. We're very excited to see how this story will be told, and hope it will eventually be told via console as well! One of Spike Chunsoft’s more interesting upcoming titles is 428: Shibuya Scramble. It’s an odd game, and can best be described as a mix between visual novel and FMV movie game, starring real actors, but that oddness just makes it all the more intriguing. First released in 2008, it’s finally being localised in the West, and offers players a detective mystery story set against the real Shibuya, and promises humour, intrigue, ten hours of gameplay, and plenty of different endings thanks to its non-linear approach to storytelling. Because it is so odd, many of you might be unsure about whether it’s for you. Thankfully, there’s a demo available right now on the PlayStation Store. It’ll let you play through the first chapter, and from there you can figure out whether you want to experience all the oddball majesty that it promises.